It’s a late Christmas night outside a busy A & E department and Keith, the security guard, is taking a breather from the hectic chaos inside. Whilst there he has conversations with nurses, an ambulance driver, a street girl and a children’s entertainer, amongst others. In his imagination though Keith is far away, standing on the Charles Bridge in Prague watching Kath the nurse dance before he makes his move, no longer a security guard but a suave college lecturer, quite at home in the mystical, ghostly and magical aura of the city. From the bleak realities and madness of the hospital at Christmas to the expressionism of Keith’s imagination we are taken on a journey from who we are to who we would like to be through the experiences of many at Christmas for whom there is no candy coating. Open, welcoming, inclusive and enthusiastic are the words which immediately sum up The Players. With a history stretching back over 35 years, we have evolved from being a group of like-minded friends putting on a play in our home town, to being a place where a wide range of people can explore and indulge in making live theatre. Over its lifetime, The Players have put on a variety of different productions including pantomimes, musicals, farces, challenging dramas, classics and new work. It is this willingness to take on a challenge whilst retaining the friendly feel of the group that has allowed us to continue and develop well into our fourth decade. Have a look at the gallery to see some past productions. Many of the shows have been put on at the Plough Arts Centre in Torrington, but we have also toured to village halls in North Devon and to some of the South West's fringe festivals. We embraced the wider community with a production of Oh What a Lovely War to commemorate the centenury of the beginning of WW1, involving local schools, choirs, historians and anyone with a memory or a story to tell. We are currently looking at ideas for a new community project. Our actors and directors are always a mixed bunch from first-timers to the highly experienced, of all ages, sexes, abilities and disabilities. We also have many other roles for people who want to be involved, just not on the stage. Stage management, scenery, costumes, props, lighting, sound, design, publicity - the list goes on. Whatever talent or interest you have, we can make use of it or help you develop it. And that is the same whether you want to join us for one show or for the long haul. We'll be delighted to welcome you. Help! 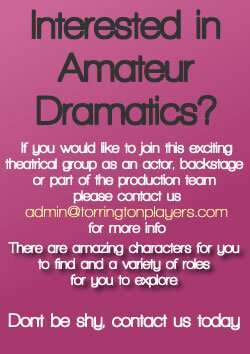 We urgently need to ﬁnd more people to work behind the scenes on Torrington Players’ productions. Please Click Here to view a full list of our previous productions.